In the heat of a Southern summer, few things are more satisfying than relaxing by the water—be it a lake, a creek, a river, or the Gulf of Mexico—while enjoying a cold beverage and listening to music or conversing with good friends. The South is a land of simple pleasures: breezy nights spent looking at the stars, long drives down country roads with the windows down, cookouts on Saturday nights. Since before the Civil War, the South has been known as the best place to find quality whiskey in America, even if that trade was perhaps not made legitimate until a certain distiller legally opened its shop in Lynchburg, Tennessee, in 1875. You know the one. Tennessee whiskey. Kentucky bourbon. Northwest Florida rum? The presence of a high-quality craft distillery in the backwoods of Crestview may come as a surprise to many in the Florida Panhandle. 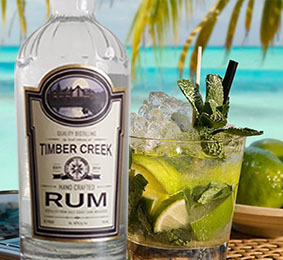 Nonetheless, Timber Creek Distillery is located right in their own backyard, a short drive north of Interstate 10 along the banks of Juniper Creek. Getting there can be a challenge that is best accomplished with four-wheel drive, but the trip is well worth it for any adventurous liquor connoisseur who is interested in visiting the distillery’s picturesque main house and one-of-a-kind manufacturing plant. “It just tastes good,” is the sentiment adamantly conveyed by Timber Creek’s master distiller, Aaron Barnes. The company, formed in May 2014, began its journey into creating fine spirits and craft cocktails when Barnes—a Paxton, Florida, native now living in Destin—and his neighbor, Camden Ford, bonded over a mutual interest in home beer brewing. Ford, who worked in high-tech engineering in Silicon Valley for about sixteen years before moving into his family’s vacation home in Destin, was looking to settle down away from a job that required him to spend most of his time on the road. He enlisted Barnes as his chief taste tester, but the two soon became passionate about a product with a little more kick than beer. They dreamed of starting a quality distillery in Florida. Barnes, a real estate broker, began looking for possible locations for the venture, and as it turned out, the barn behind his parents’ 26,000-square-foot home in Crestview was just the right fit. After receiving the blessing of Barnes’s parents, he and Ford started planning—“over drinks of hooch and whiskey, of course,” Ford says.